It was a long winter here in the eastern Ontario highlands, and nights are still bracing. 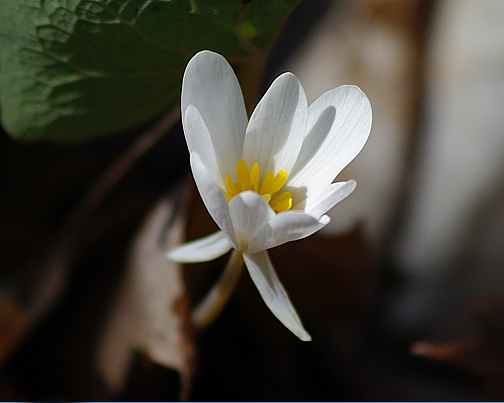 It will be another week or so until colonies of bloodroot are well and truly up and blooming, but early specimens lift their gold and white heads in protected nooks here and there in the woods. The shy white bloomers with their golden centers are dear to my heart and something of a seasonal marker. Encountering this one glowing softly in its flickering, stone-warmed alcove, I felt like kneeling and kissing the good dark earth where it made its home—it was that perfect. Ignoring my painful and protesting knees, down I went and stayed there for quite a while, nose to nose with the little wonder, feasting my eyes and attention and discovering another fragile blooming within. Getting up again was quite another story. It was one of those wild epiphanies I love so much, especially in springtime when the north woods are just coming to life, a moment of kensho, one of those fleeting intervals of quiet knowing and connection that I like to call "aha" moments. Forget the fancy stuff - this right here is the ground of my being. Happy Beltane (or May Day), everyone. May there be light and blooming and fragrance in your own precious life, in your own part of the great wide world. Happy Beltane to you, Cate! Beltane blessings of strength and joy to you. I agree with you, those perfect little moments are what life's all about. May your days be filled with them. Brightest Beltane blessings to you and yours!